Summerley Colliery & Coke Ovens. SK 36967 78063. Photographed in 2005 whilst the site was being secured. Coke ovens marked on map. 1895. 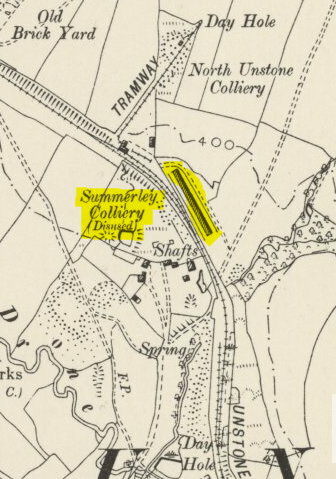 Summerley Colliey worked the local Silkstone or Blackshale seam. It was sunk in 1871, producing coke for the Sheffield iron and steel works from its beehive shaped coke ovens. The colliery closed in 1884. James Rhodes and Son supply their hand picked (branch) coal and Silkstone house coal, seconds house coal and screened Silkstone nuts direct to customers at the lowest market prices of the day to any part of the town. 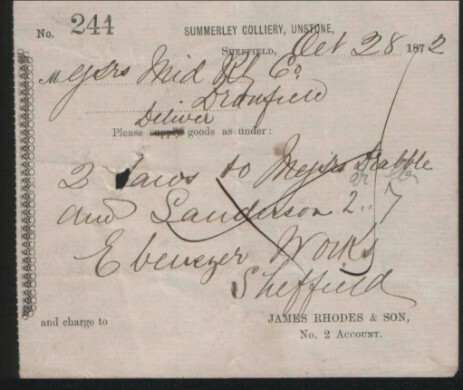 Information as to prices and orders addressed to No3 coal office Chesterfield station. Mr J.D. Styring has received instructions from the owners of the above colliery to sell by auction 28 ponies and horses and surplus stock etc. At the court of Chantrey. Summerly colliery Dronfield. Messrs. Nicholson, Greaves and Palmer are instructed to sell by auction on Monday 1st December. 170 pit corves, horse box, cage, tram rails, 10,000 sleepers and boiler. Dronfield station is within five minutes walk to the colliery.